KOH LANTA: A five-meter long king cobra discovered by an 11-year-old girl was caught by a Koh Lanta local yesterday evening. Worawut Longasun says he has trained himself to capture snakes by watching videos on television and YouTube. The snake was found in the storage area of Aree Wansuk’s house by her daughter who spotted the reptile’s tail while playing with her friends nearby. “My daughter ran up to me and insisted that she saw a black snake in the storage area,” said Ms Aree. Good to see a self made man. Non of this , spending years in snake caching school for him. I'm willing to bet that he had a previous job that included using a whistle and it all started from there. An offensive troll post has been removed as well as the appropriate reply describing how disturbing the troll post was. So did the snake live to see another day or was it on that nights menu?? Not years, I did a two day course while working in the Australian desert. The biggest snake I caught was a 2 metre brown, kudos to the man for taking on the 5 metre monster!! Lets hope he released the snake in the jungle and it did not end up on the kitchen table. Our wildlife is disappearing at an alarming rate especially our large ocean mammals. As Bugs Bunny use to say "Thats all folks!" in Thailand to get me to do that job!! According to a linked article in the OP's link, he released the last one that put him in the news. Hopefully, this one, too. Gotta love those Village Headmen, they have an answer for everything. Not many left these days. 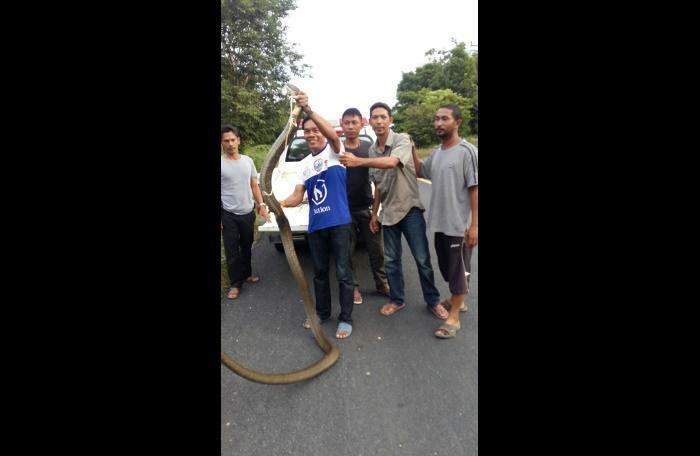 If it's actually 5 metre that would be the biggest cobra ever nabbed. Google gives 4.7 metre as the biggest ever captured. But you can't believe everything you read. Change is close to real that this snake is the samke snake he caugyt in March of this year. Snake return to places they have been catched. Places they tagged snakes and saw the snakes return to the places. Around where I lived before there was a snake the crossed the road everyday between 15:50 and 16:05 hrs. Most village have the policy to let the snakes live. Meaning tthe changes are that the snake will return. If i had to chose between the Phanga man who raped the little girl , or her being bitten by this snake , set free again , I 'd know what to chose.